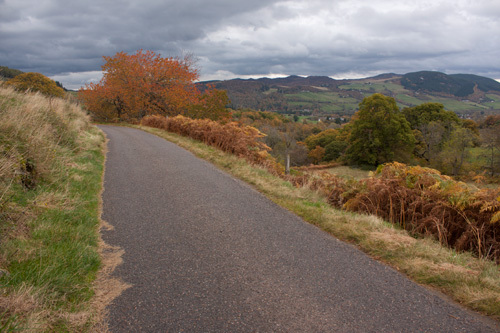 A few weeks ago I was on holiday in Scotland, with the lovely autumn colour. 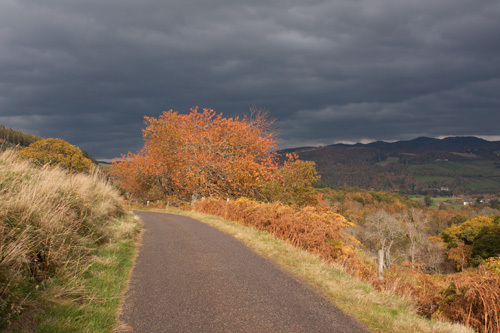 Unfortunately the weather was mostly cloudy, which didn't really do justice to the colours. Here's two photos, not particularly good, but they show the great difference sunlight makes. One was taken on a walk up the road, the other on the way coming back. Of course, with early morning / late afternoon sun, it would be an even greater difference, but walking only at those times is rather impractical. Not to mention that most days there was no early morning or late afternoon sun. I was hoping to take some autumn photos around the local area once I got back home, but the weather here (Leicestershire) has been rubbish. Other than a few peeks of the sun through the clouds, it has been mostly overcast. One thing I found while shooting in the forests of Scotland was that sometimes ISO1600 (the top ISO speed of the Canon 450D camera I was using) was not enough for a hand-holdable shutter speed. Although I had the tripod with me, setting the tripod up and taking it down again would take too long if I did that every time I wanted to take a shot. When I got back home I received an email about a device called the Steadepod from 7dayshop. This looked like it could be quite good for taking photos handheld with slow shutter speeds, so I bought one, though I have yet to test it out. I will probably add a short review to the blog when I have used it properly. The 360cities website is much better than my 360vrs website. The viewer they use is better, incorporating multi-resolution ability (it loads higher resolution tiles the more you zoom in). Their viewer also works on ipad and iphone. They also have a map facility and google earth integration. All these are things I could add to my own website. But it would take a lot of time. There doesn't seem to be a lot of point working on these for my own website if I can just use 360cities where it is already setup for me. The Google Earth integration they have is not just that you can download a KML file to view panoramas from the website in Google Earth, but they are integrated into Google Earth as a default visible layer. So everyone who downloads Google Earth can see panoramas from 360cities by default (they appear as a small red square). This is very unlikely to be something I could negotiate for my own pano website. I upload some of my photos to photo sharing websites like Flickr, so why not upload panoramas to a panorama sharing website like 360cities? Having my panos on there lets more people see them than would otherwise, and gives me more exposure. On your profile page at 360cities you can add your contact details and a link to your site, so no problem there. I don't have control of the site. So the site owners could decide to do something I don't like / agree with, or the site could suddenly be closed. I think this is very unlikely, however for the moment I will continue to upload my panoramas to my 360vrs.com website as well. This way my panoramas can still be seen online somewhere even if 360cities.net does close or does something to make me close my account there. The fact that I don't have control of the site though, could be seen as a benefit in some ways - I don't have to worry about the administration of the site, upgrading software etc. My panoramas on 360cities are likely to show up in Google search results above the same panoramas on my own website. Since the 360cities site is much better than mine, I don't really consider this a problem. If I had lots of ads on my site that were bringing in revenue this would be more of an issue. The pano on 360cities ranking higher would mean that people would click through to that rather than my own site. So my own site would get less visitors, and hence less clicks on ads. So that's what I've been doing lately photographically wise. My plans for the moment are that I have quite a few panoramas from Scotland that I want to get processed, and also of course there are still lots from my 2009 trip to Japan that I haven't done yet. I am also planning to add an option to the Image library to allow viewing files by newest first (currently they are listed in order of rating). So a lot of work for me to be getting on with. And if we get some nice weather, I'll probably be out taking photos in the local area.